Currently we at RTL-SDR.com are selling upgraded RTL-SDR dongles on our store. We’ve worked hard to reduce the most common issues that the cheapest generic dongles have, whilst trying to not significantly increase the retail price so that these devices stay ubiquitous. In each batch that we’ve produced so far we’ve tried to make some improvements over the last. Previously we’ve added a TCXO, SMA connector, and bias tee and now in the latest batch we’ve added a metal case and passive cooling. The new units have been in stock at our Chinese warehouse for almost a month now, and they are now back in stock at Amazon USA as well (shipping soon). They are priced the same as before: $24.95 USD for the unit with antennas and $19.95 USD for the dongle only. If you order from the Chinese warehouse all units come with free registered air mail shipping (1-4 week delivery), and free shipping is available on Amazon for USA customers (<1 week delivery) if you are a Prime member or spend over $35. To purchase please see our store page at www.rtl-sdr.com/store. Aluminium case. We’ve upgraded from a plastic case and now all units come with an aluminium case standard. The aluminium is 1mm thick and is treated with an anti-anodizing coating to improve conductivity. However, some natural anodization still occurs. The dimensions are similar to the plastic case at 69 mm x 27 mm x 13 mm. The new RTL-SDR dongle design with aluminium case. Ground tracks on the PCB. The PCB size has been increased slightly to accommodate side ground tracks. These ground tracks should make contact with the aluminium and provide ground conductivity to the case. New RTL-SDR PCB with side ground tracks. Passive cooling. As the case is now metal we can apply a thermal interface material between the PCB bottom and case wall. The interface material we’ve chosen is a 3mm thermal pad. This is a soft silicon pad with high thermal conductivity. This appears to provide adequate cooling to ensure the dongles run properly at above 1.5 GHz. Thermal pad on the bottom of the PCB for improved heat dissipation. The metal case and side ground tracks should reduce the amount of interference received by the dongle through sources other than the antenna. The passive cooling should also be enough to ensure that the dongles run properly at above 1.5 GHz, though we still would recommend running them in a cool shady place, rather than out in the direct sun if monitoring L-band signals. If you find that the conductivity between the PCB and case is not good enough, then you can try thickening the side ground tracks on the PCB with a layer of solder – we will be trying to increase the thickness by default in subsequent batches. Soon we will also have the metal cases for sale by themselves for those who want to upgrade from a previous batch (EDIT: Now on sale!). Though please note that although the older SMA PCBs fit in this case, the previous batches PCB’s are a little smaller than what this case takes so it may fit a little loosely. The old PCB’s also don’t have the side ground tracks for improved conductivity, but even with no ground conductivity it is still possible for the case to work as a Faraday cage. These cases will be available on the store page in a few days at a very low cost and they will only be available only from the Chinese warehouse. Once again we hope people will enjoy these changes, and feel free to let us know what you think and what you might like to see in the future. I have received mine yesterday and I am veeeeery happy with it : SMA connector, TCXO, and, last but not least, 4.5V antenna supply included. I have shortened the two pads on the PCB and it works perfectly, powering my F5ANN active antenna from the stick on the RPi. I have removed all the wires and traps which were used for this purpose. Simpler, better ! March 25, 2016 - 7:24 pm P to the R.
Received my metal case but maybe because my rtl-sdr dongle is one of the first, it has no side ground tracks. The dongle wobbles a little bit inside the case, and if the usb side is steadier, there is no guarantee the antenna is touching the case. How can I improve grounding? I can add a metal ring to the antenna side, but the usb dongle appears to be touching the aluminium case somewhat. Should both be grounded to the case? I ask because I see here someone mentioning they isolated the usb connector from the case. What’s a good practice? Thanks. I found this great SMA Y cable. I can now run my two RTL-SDR dongles on one antenna. Plus I use this USB cable to connect multiple Dongles to the computer. Using hot-air tools I soldered a longer SMA connector in place of the one provided so that I could use an SMA lock-ring and nut to clamp the input socket directly to the aluminum case. I also ran a very thin polyester tape around the base of the USB plug, to insulate it. This is now a very quiet dongle indeed. Thanks for all you have done for the RTL-SDR community! Hi Trevor. I’m fighting with RFI and would like to better understand how you improved things… Are you saying that insulation on the USB connector will remove/reduce interference traveling on the USB extension cable since the two “grounds” will not be connected ? Mario, RFI can come from the dongle circuitry itself, from the computer via the USB cable, and via the antenna. Usually the USB is the worst offender. I have found that reducing current along the USB cable with clip-on ferrites is a good strategy, and one of the ferrites should have several cable ‘turns’ through it. Generally (IMHO) the USB connector is best isolated when using such an approach, but it depends on the nature of the signal from your computer. Great, this rtl-sdr dongles are the best. I cant wait to order one. Great works you are doing. Can’t wait to get a little extra spending cash to pick up one, maybe two of these newer ones and be able to get the metal case for my existing ones I already own. Love these things! I am working on getting my amateur radio license. Only 5 more sessions to go. Incidentally, I ordered from the Chinese warehouse for shipping to the USA. Ordered early morning on Dec 28th, and they arrived on Jan 9th. Pretty fast taking into account the New Years holiday. Thanks! Some countries like the USA/UK/AUS/FR/RUS support priority air mail, and we use that wherever we can even though it costs us a little extra. It’s sometimes even as fast as a private express courier like UPS or DHL, especially for the UK – the fastest i’ve seen is a 3 day delivery! But other countries that don’t have express air mail will usually take 2-4 weeks. Why do you need to order from Amazon? I ordered directly and it was shipped from China at a reasonable cost. Just select international shipping. 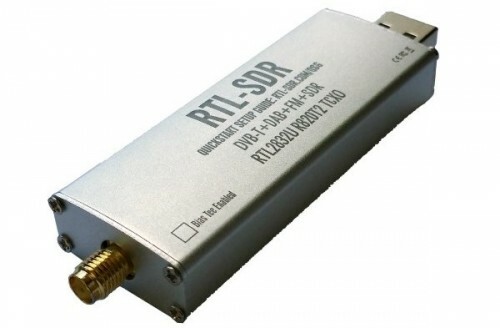 We have full international shipping available from our Chinese warehouse on our store page https://www.rtl-sdr.com/store.